The Philadelphia Eagles came to the Super Bowl as underdogs this weekend. That is, until Nick Foles took the New England Patriots and the world by suprise, throwing for 373 yards and three touchdowns, winning his team their first ever Super Bowl win and their first NFL championship since 1960. And it seems Nick had a special supporter by his side the whole time… and he didn’t hesitate to give thanks! Nick Foles is an outspoken Christian who plans to become a pastor when he retires from football. During the game, he could be seen wearing a special wristband to display his faith. The six-year veteran wore a “WWJD” bracelet on his right wrist. The slogan – which stands for “What would Jesus do?” – is used as a guiding light by Christians as they apply their faith to their day-to-day lives. And even amongst the Super Bowl excitement, the gesture didn’t go unnoticed by fans. 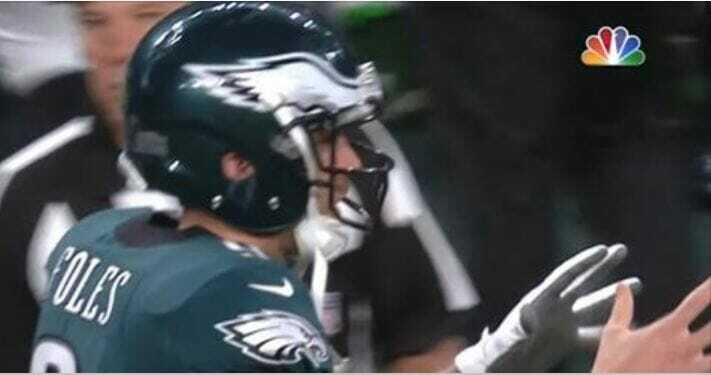 Did anyone else see Nick Foles bracelet he was wearing? It said WWJD (what would Jesus do?) I love that. There’s nothing I love more than settling down with my friends and family in front of a football game, but Nick’s gesture really made this game extra sweet for me. Awesome job, Nick! Help us share Nick’s incredible message and congratulate the Eagles on their win by sharing this story with your loved ones on Facebook!